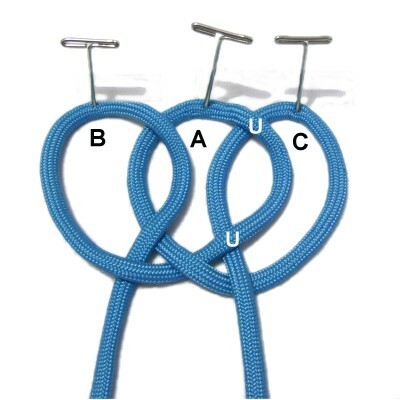 Description: The Pitcher Knot is an interesting historical knot that is not very well known. It is sometimes called the Bottle Sling. The name comes from the fact that it can be used to make handles for pitchers and bottles. The crossed elements surround the neck and the two bights form the handles. 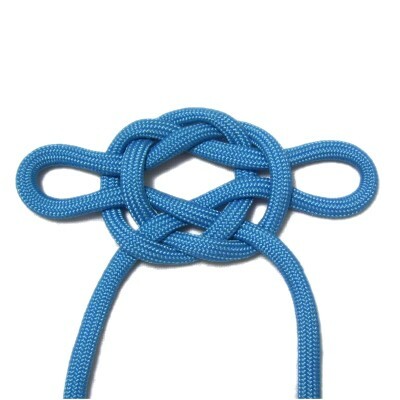 I've added two images at the bottom of the page to show you how this knot works. 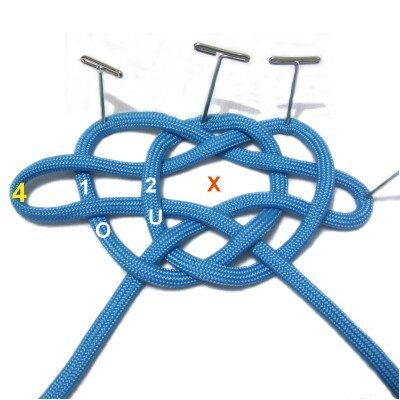 The Masthead Mat is a variation of this knot, and the Maedate knot is related, too. Step 1: To practice, you need one cord at least 36 inches long. 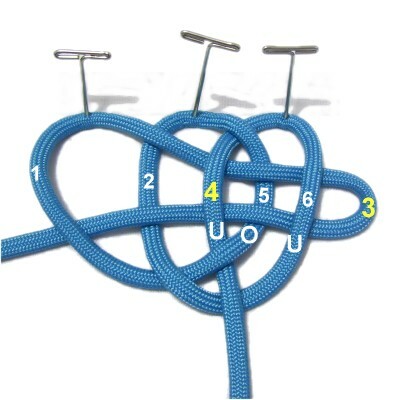 Make a loop in the center of the cord, crossing the two halves left over right. Mentally label it (A), and secure it to your board. 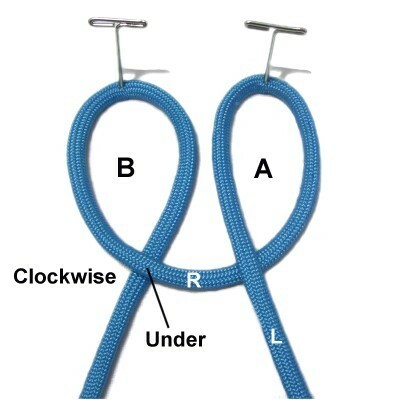 Step 2: Use the right half of the cord to make a clockwise loop, placing it to the left of loop A. Pass the end under to form the crossing point. Mentally label it (B), and secure it. 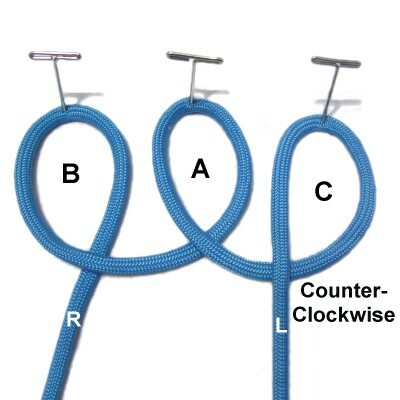 Step 3: Use the left half of the cord to make the third loop in a counter-clockwise direction. 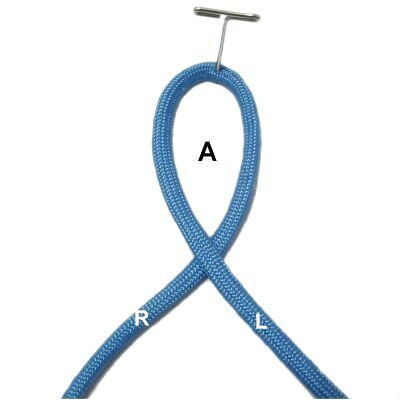 Place it to the right of loop A.
Mentally label it (C) and secure it. 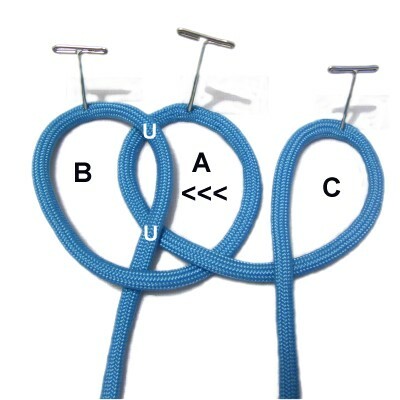 Step 4: Move loop A to the left, placing it under the right side of loop B. Step 5: Move loop C to the left, placing it under the right side of loop A.
Mentally number the segments 1 - 6, moving left to right. Segments 3 and 4 will be moved in the next two steps, so make sure you can identify them easily (they lead to the ends). Step 6: Pull segment 3 to the right to form a bight. Pull material from the end as needed. Pass it under segment 4, over segment 5, and under segment 6. Secure it when you are finished weaving. Step 7: Pull segment 4 to the left to form a bight. Pass it under segment 2 and over segment 1. The (X) in this image is the space you will leave open in the next step. 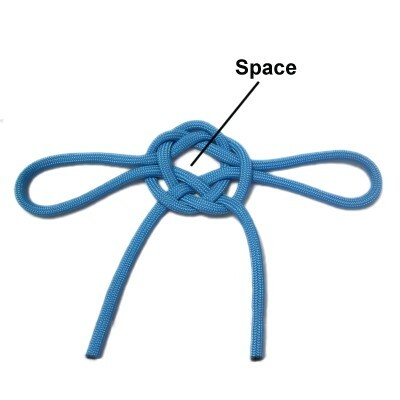 Step 8: Tighten and adjust the Pitcher knot, so the crossed elements surround the space in the center. The two bights can be any size. Step 9: (Optional) Pass the top portion of a bottle through the opening in the center of the Pitcher knot. Pull on the ends and bights to tighten the knot around the neck of the bottle. 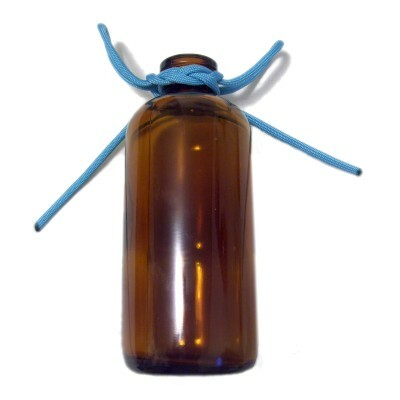 This shows one way the Bottle Sling can be used. 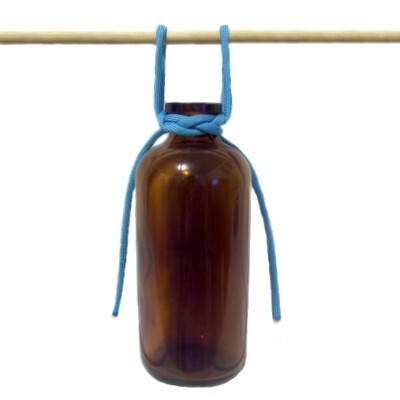 The bights act like two "handles" that can be used to suspended the bottle from a dowel or hook. You can attach new cords to the knot if you want to cover the bottle with knots, or just finish off the ends and leave it as shown.